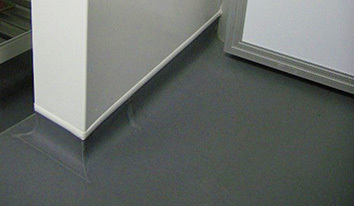 Hycom install and supply all of the product lines by our online partner Altro Floors. Vinyl flooring comes in 2m wide rolls and can be fitted with a flat finish into the walls or with a coving for a more hygienic and waterproof system. The 2m widths are up ot 20m long and are joined together by heat welding. Altro Walkway, Altro Aquarius, Altro Stronghold and many more! Our website is currently being rebuilt so that you can order your flooring simply by the quants you need, or via our instant quote calculator from your measurements, an amazing and accurate feature that we hope will have you coming back to us time and time again. In the meantime, please call us on 01420 559 802 and we'll be very happy to help you. Hycom have been installing hygienic anti-slip Altro and other makes of Vinyl Flooring for over 10 years. Vinyl Flooring comes as 2m wide rolls, normally 20m in length, and is welded together to make a durable, waterproof and chemically resistant surface.